Working with OurMeeting also has attractive advantages for IT managers. OurMeeting is a cloud service.The advantages of the Cloud are well-known by now. No extra load on servers, no maintenance. Another advantage of OurMeeting is the fact that users have offline access to their documents. So even when the internet connection fails, participants can still prepare for the meeting, and the meeting itself can still continue. The app is synced as soon as the connection is back. If required by security standards, OurMeeting can be installed in your own datacenter and is then remote managed by us. Please contact us to discuss the possibilities. The load on e-mail servers is continually increasing. This load can be reduced by implementing paperless meeting. OurMeeting offers participants their own document box. Meeting sets are distributed to boxes and no longer to e-mail servers. Our standard solution is secure, but we offer additional security features for device and app. We can set two-factor authetication for documents. Dragging stacks of paper to the meeting is a thing of the past. 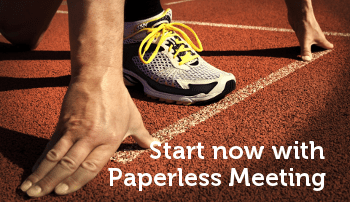 Meeting participants benefit greatly from Paperless Meeting.